P104 14kt white gold .75cttw blue diamond pendant. 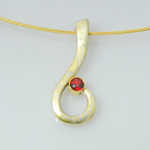 P105 18kt tri gold pendant with Blue Zircon and diamond. P108 14kt white gold with a 11mm Southsea cultured pearl and a .25ct diamond set in a 14kt white gold bezel. 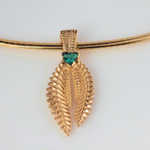 P201 14kt yellow gold fern pendant with lab grown emerald and 16" 14kt yellow gold omega.